"This is a simple recipe with a spicy kick for garlic lovers. It is my combination of a much loved linguine and clam sauce dish and a recent introduction to orzo pasta. I have several variations for this recipe. Add more red pepper for extra spice. Substitute the chicken for clams or shrimp. Substitute the spinach leaves for diced tomatoes. 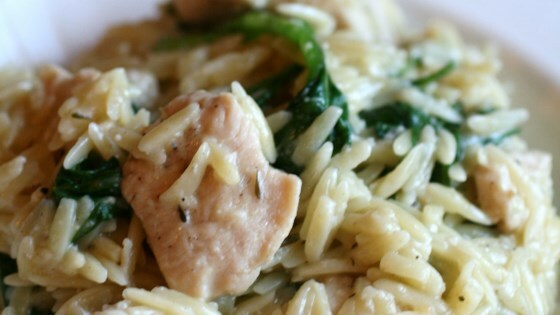 I've also added spices such as basil, rosemary and oregano bringing a distinct Italian flavor to the dish." this was great with some changes. chicken broth for orzo. lemon juice and rosemary mixed in in the end. Yummy! Very easy to make and full of flavor. I did find it a tad oily though, so next time I will only use half the olive oil. People ask me to make this all the time! When I don't have fresh basil, ground works fine. Diced tomatoes also taste good with this.